Science never has been my favorite subject. I don't hate it, but I need time to comprehend it all. Unbeknownst to me until recently, there's a line called Basher Science that has been helping kids with science for ten years. Of the many books available, I received the Simon Basher Rocks and Minerals book. It presents geology of fossils, minerals, crystals, and rocks in interesting form. Each geological formation is made into a character and their story is told in autobiographical form. For instance, Talc is illustrated to look like a white gingerbread man, and readers can learn about all its uses. There's an index and a glossary at the back of the book. This book puts geology into a more personable light, and I feel children will be more apt to want to read this than a dry words in a textbook. The toy line includes Basher Science figurines, card games, collectable cards, play sets and experiment kits. Children 6+ will now be able to collect and play with their favourite characters from Basher's Periodic Table, Physics, Biology and Rocks and Minerals books. They are a nice addition to the books and children can learn about science in a way that's interesting and engaging. 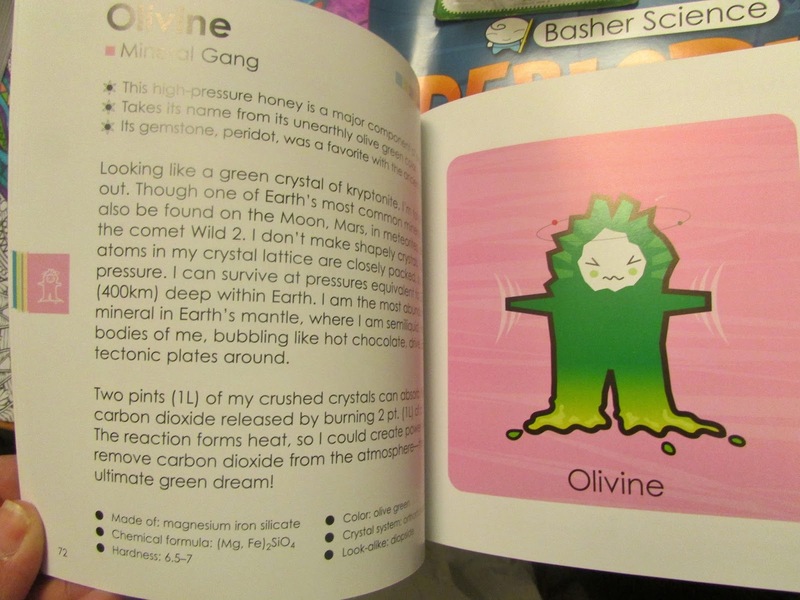 For instance, the Biology Card Game teaches facts about aspects of science, while children are competing to win. The card games include a mini-figure. 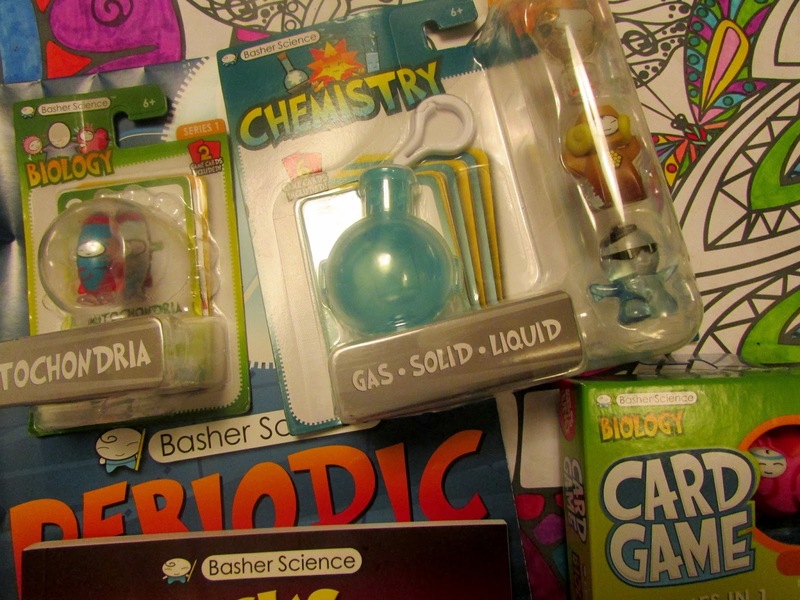 One person will win a Basher Science Swag Pack that includes random assortment of books, card games, play sets, and figurines. My favorite subjects were math and history. Social studies and Literature have always been my favorite subjects! My favorite was math in school. I have a nephew who is all into science so entering this for him. My Favorite subject(s) were....Art...and...lunch...thats a subject right? Our daughter(8) and now our Son LOVE science! I'm entering for them, this is right up their alley. Good to know these are available for purchase. My favorite subject in school was Accounting -- that's why I'm an accountant today. My granddaughter likes science and history. My kids like reading the best. French was my favorite subject. Our kids love science! They were super excited about a recent experiment that made their pennies change color. Two of my favorite subjects in school were Reading in elementary school and Biology in High School. My favorite subject was always a tie between English and Art. My favorite subject was always music then English. My favorite subjects were Earth Science, history and English. Our kids love science and art. My favorite subject was English. I loved Science too, I just wasn't into the frog dissection stuff. My Grandniece is in first grade, and I think this would be a great starter for her. My sons favorite subject is science. English and science were my favorite. My favorite subject in school was always math. I liked the problem solving of equations. My daughter is an absolute science freak. She loves science class and loves doing experiments and projects in science. My favorite subject was science. I loved studying cultures in social studies. I loved English and Spelling. My daughter likes math, science, and reading. I was more of an art class kind of girl. My favorite subject was math. My favorites were languages. In high school, I took French, Spanish, Latin, and Danish at the same time (Danish at the local college.) It was occasionally a little confusing! My favorite subjects were science and history. My daughter is in first grade and she LOVES Science! Her 4 year old brother is fascinated by it too! They both like P.E. I think they like it because they actually get to run around. All other subjects they have to sit at their desk. I liked history and science. His favorite subject is math. My favorite subject in school was Social Studies. My favorite subject in school was mathematics. Reading when I was younger, math and social studies when I was older. I used to love Biology. My favorite subject was always Math. My favorite subject in school was math. Our daughter loves science and doing experiments and learning new things. My favorite was science and my son loves history. My youngest loves math. I was awful at it! my favorite subject in school was math. i like math because it's got an answer. My favorite subject was choir... and then I became a music teacher! I liked earth science the most My nephew would really enjoy this. My favorite was science class, always intrigued me. My fav subjects were math and science. My favorite subject was journalism. I liked English in school. I always liked Math in school. My favorite was Art and my son's favorite is Math. My favorite subject was math and my son loves science. I always enjoyed reading class. My daughter loves PE! Thanks so much for the chances to win. My daughter loves reading and social studies! Both of our sons love science! My kids favorite subject is science. Anything having to with animals and bugs they really love to learn about. Science is his favorite subject.